Just in case you’ve never heard of it before, Habbo Hotel is produced by the Sulake Corporation which is an online entertainment company focused on virtual worlds and social networking. Habbo Hotel is the world’s largest and fastest growing virtual world for teenagers, and localised Habbo communities all around the world are visited by millions of teenagers every week. Snow Storm was a fantastic multiplayer game – great fun, so I’m told. Anyway, this short project was to produce a 15 second commercial, the brief requiring a youthful sounding, enthusiastic voice for the intro and a big Don LaFontaine “movie voice” style for the outro. I think it worked quite well and the Habbo Snow Storm team were pleased with it – which is the main thing! 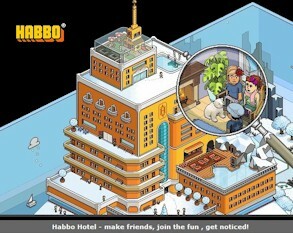 Habbo Hotel can be accessed via the local Habbo sites, and through the world’s largest social networking site Facebook, where all 31 Habbo communities are also available. Through Facebook Connect, Habbo users around the world can easily find their Facebook friends in the virtual world and share their in-world experiences. Nice commercial, that voice is perfect for the ad! Unfortunately though, Habbo currently has removed (as of March 2009) Snowstorm as a game from it’s community (because of their conversion from Shockwave to Flash platforms, it is yet to be redeveloped). Sulake haven’t given any word as to when (or if) Snowstorm will even return. Was this ad produced only recently? Is the commercial going to be used to promote Snowstorm once it comes back in Habbo? Hi Jack and thanks very much for your comments. It was quite a disappointment to see it go at first, but it’s almost been 9 months and we don’t even know if it’s being developed as of now, or if it will return in the future. They need to inform us about the news and updates of the games, not waste our time. I understand there’s other work to be completed, but the action-packed multiplayer game was what attracted the community, and i don’t see that happening ever again. Next post: Stephen Fry: “…pure, undiluted pleasure and friendship…” That’ll be Listening Books!